Fish-eating seabirds like the common murre — which nest in the rocky intertidal zones along the coast — can give scientists clues to the status of native finfish by how they behave. NEWPORT, Oregon – Most of us glimpse saltwater fishes only as grilled fillets on a dinner plate or as HD images on a TV screen. Even the fishermen who catch our salmon steaks and cod cakes rarely see a live fish that isn’t thrashing on a line or flopping in a net. So how do we keep tabs on the hidden, finned denizens of the Pacific? How can we gauge their health and their habitat? How can Oregonians tell, for instance, whether new state laws banning fishing at five Oregon “marine reserves” will make a difference for depleted stocks by protecting juvenile fish, BOFFFFs (“big, old, fat, fecund female fish”) and other organisms that together form an intact marine ecosystem? One way to tell, says ornithologist Rob Suryan of Oregon State University, is to study birds. At first blush, observing birds to find out about fish seems like a disconnect. But as Suryan explains, avian species (visible from the shore) can serve as stand-ins — scientific surrogates, in a sense — for their ichthyo-brethren swimming, unseen, beneath the sea. Fish-eating seabirds like the common murre, Brandt’s cormorant and Caspian tern — which nest in the rocky intertidal zones along the coast — can give scientists clues to the status of native finfish by how they behave. Abundant birds raising robust chicks indicate, among other things, ample stocks of the prey species marine biologists call “forage” fish (sardines, sculpins, smelt, sand lance). If prey fish crash or migrate to new waters, for instance, their feathered predators may fail to thrive, thus becoming harbingers of a changing marine ecosystem. In the bigger picture, these kinds of bird-fish patterns may hint at shifting conditions ocean-wide. “We refer to birds as ‘ecological equivalents’ of fish,” says Suryan, director of OSU’s Seabird Oceanography Lab at the Hatfield Marine Science Center in Newport. “That’s because seabirds eat very similar prey items as commercially important fish like Chinook salmon or tuna or halibut.” A slump in sardines, for example, can mean trouble for nesting murres struggling to feed their young and, at the same time, signal scarcity for spring Chinook trying to put on fat for migrating upstream to spawn. If you happened to drive down the Oregon coast this past summer, you might well have seen science in action. An eclectic team of volunteers, huddled in pairs over spotting scopes, field notebooks and coffee thermoses, spent much of the summer observing the seabirds at the Cape Perpetua Marine Reserve and Marine Protected Area, which includes Sea Lion Caves and Heceta Head. Through chilling mists and whipping winds, they watched hour after hour, week after week, keeping detailed records as colonies of pelagic cormorants and common murres played out their biological cycle of pair-mating, egg-laying, fish-catching, chick-feeding and, if all went well, fledging a new generation of the sleek black diving birds so familiar to beachgoers. The birders were on the lookout, too, for bald eagles, brown pelicans and other predators threatening the nests. Suryan’s lab provided scientific guidance to the team — birders from Portland Audubon, ecologists from the Nature Conservancy, Sea Lion Caves manager Gerald “Boomer” Wright and his volunteer crew at the famous tourist destination, the Oregon Department of Fish and Wildlife (ODFW) and the Oregon Department of Parks and Recreation — as they studied the cormorants and told their story to curious tourists. The dramatic headland at Cape Perpetua, known for its ancient stands of giant spruce and its madly churning sea spouts, is the first of Oregon’s five marine reserves to designate an official Bird Protected Area within its study site. OSU and the Oregon Coast Aquarium are under contract with ODFW to conduct scientific monitoring of the marine organisms — such as rockfish, giant kelp and purple urchins — that inhabit the reserves. A cadre of scientific divers, trained at OSU, is already gathering data in the rocky reef. As Oregon’s first reserve to be fully implemented, Cape Perpetua is getting a jumpstart in the critical data collection, designed to test the conservation power of the marine reserve concept. But ODFW, which is tasked with monitoring the impact of the 2011 legislation that created the no-fishing and limited-fishing areas, is putting the lion’s share of monitoring funds toward counting and measuring underwater dwellers. There was no state money for seabird studies. 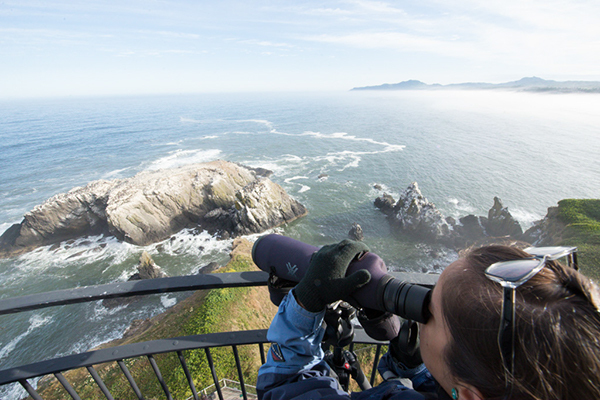 Find out more about Oregon State University’s research on seabirds, as well as spotted owls, meadowlarks and other Northwest species, in the upcoming cover story, “Avian Nations,” in Terra magazine.